Rachel Sprinkle-Strong, owner and “chief peddler” of POPcycle Creamery in Sacramento, cheerfully describers herself as an “ice cream snob.” But she’s not the kind of person you’d call arrogant. With her sunny disposition, warm smile, and perennial optimism, Rachel is as charming and friendly as the ice cream she serves. Still, this is ice cream like no other ice cream you’ve tasted. Flavors like fleur de sel oreo, pumpkin donut 5 spice, strawberry balsamic, and vanilla bean-cardamom showcase Rachel’s ability to combine common and unusual ingredients to create extraordinary ice cream flavors. They seem to explode on your palate. Her ice creams insist that you pay attention to them: stop whatever you’re doing and take notice. You’ve never had ice cream like this. But it’s not just the flavors that make POPcycle Creamery unique. First of all, the packaging and presentation are genius. POPcycle Creamery is sold not as scoops in a cone or in small cups like gelato, but as pushup ice cream pops that are thoroughly modern yet familiar and even a bit nostalgic. They’ll evoke your earliest memories of missiles, 50/50 bars, and pushups, which you lined up to buy from the local ice cream truck as it drove down your street on a warm summer afternoon. You know what I’m talking about. Secondly, Rachel hawks her goods from a custom-made bicycle (or technically, a tricycle) that’s front-loaded with a freezer and umbrella. It’s an unusual delivery system that, again, is both modern and old-fashioned – and easy on the environment. “The first job I ever had was actually in an old-fashioned ice cream shop in the Midwest that has been making all of its own ice cream for over 60 years,” Rachel told me when I interviewed her at the GOOD street food + design market in early November. Ever since then, Rachel has had smoldering passion for ice cream and has sought out the best shops wherever she’s gone. “Whenever I travel, I always like to check out the hometown ice cream,” she says. From that first job in Columbus, Ohio to opening her own ice cream business in Sacramento, Calif., Rachel’s journey has been anything but a straight line. “I went to college and did the corporate thing for about 20 years,” Rachel says. But two years ago she was laid off by the large telecom provider where she had been working in communications and quality assurance. Like many Americans who were affected by the recession, Rachel used that “opportunity” to try something new – to follow a passion and see where it would take her. In many ways, POPcycle Creamery is a product of our times. Small businesses often emerge during recessions, but I believe that a business like POPcycle Creamery would have been much more difficult to launch even a few years ago. Today, social media and online marketing make it possible to promote new businesses less expensively. In addition, our national obsession with food has created an environment where unique, high-quality products like Rachel’s can begin, find an audience, and thrive. And lastly, I would credit the explosion of mobile food trucks for offering a new model for talented people like Rachel who want to create a food business. What new mobile food trucks have done is to use the Internet and online marketing to connect directly to their customers. Social media tools like Twitter enable them to announce lunch and dinner locations as well as specials and changing menus, keeping their customers informed and engaged in real time. These vendors have also shifted consumers’ perceptions of mobile food trucks, casting themselves as high-quality alternatives to brick-and-mortar restaurants. 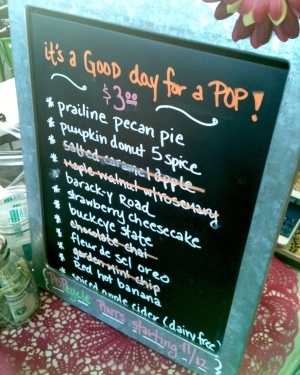 While POPcycle creamery is clearly not a mobile food truck, it does share some of their attributes, particularly the use of social media to promote the business. “Everything I’ve gotten publicity-wise has been free so far,” says Rachel who promotes her business on Twitter and Facebook as well as her own website. She’s also benefited from good local press in publications like Sacramento Press and Good Day Sacramento. “I’ve done no formal advertising,” she says, noting that her network, word of mouth, and free promotions have enabled her to establish a presence in the Sacramento food scene. 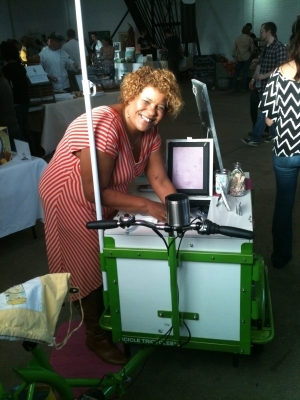 Like food trucks, POPcycle Creamery also demonstrates the idea that great food can be “mobile.” That is, it can come to you. Delivery is one of qualities that makes POPcycle Creamery truly unique among ice cream shops. Rather than setting up shop (so to speak) on a street corner in downtown Sacramento, Rachel focuses on special orders and deliveries, and on corporate events and private parties. Finally, this analogy is appropriate for at least one other reason: Rachel's original plan was to start a mobile food truck. She was working on a concept with a business partner but eventually decided to begin on her own, in part because of the upfront cost of purchasing a food truck. 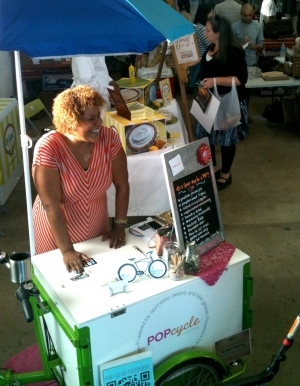 POPcycle Creamery gives Rachel greater control and allowed her to launch the business without taking on debt. Still, I think it's fair to say that food trucks helped pave the way. 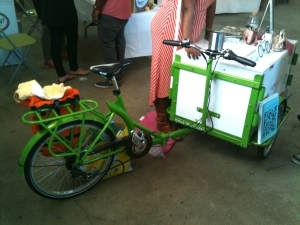 So now that the wheels are spinning for POPcycle Creamery, what’s next? “This summer I would love to focus on the wedding business, bridal showers, and everything that goes along with weddings,” Rachel says. Like corporate events, weddings offer an opportunity to grow her business more profitably and on a larger scale. Long term, however, opening a storefront is Rachel's ultimate goal. Someday she’d like to have the kind of ice cream parlor like the one she worked at in her first job. A place that focuses on quality ingredients and exciting flavors. Where she can serve people like her who simply love good, handmade ice cream. POPcycle Creamery is one stop on a life-long journey for Rachel Sprinkle-Strong, and I have a good feeling she’ll reach her destination. What’s Your Story? We’d Like to Share it. Do you run a small business in food and wine – or know someone who does? At 26 Brix, we’re always on the lookout for good stories to tell in our blog. We like to promote people and businesses who are doing original, creative work, who have a great story to tell. Through our website and social media (especially Twitter, Tumblr, and Facebook), we’re building an audience of people who also appreciate food and wine and like to support local businesses. Can we help you tell your story? We don’t charge for this work; it’s our way of supporting and participating in the restaurant and winery community. Please contact us if you’re interested in having a story written about your business.